What Are High Output Alternators? High output alternators provide more juice than factory units. When a vehicle ships from the factory, it typically comes with an alternator that is designed to meet the most basic needs of its electrical system. That means most factory alternators are already running pretty close to their limits just to keep the lights on and enough provide juice for what is probably a pretty anemic OEM sound system. Although there is typically some wiggle room with the factory charging system, the addition of too many premium car sound system components—or any other heavy electrical load—can result in dim headlights, poor audio performance, and even more serious problems. The answer to this problem, in many cases, is a high output alternator. 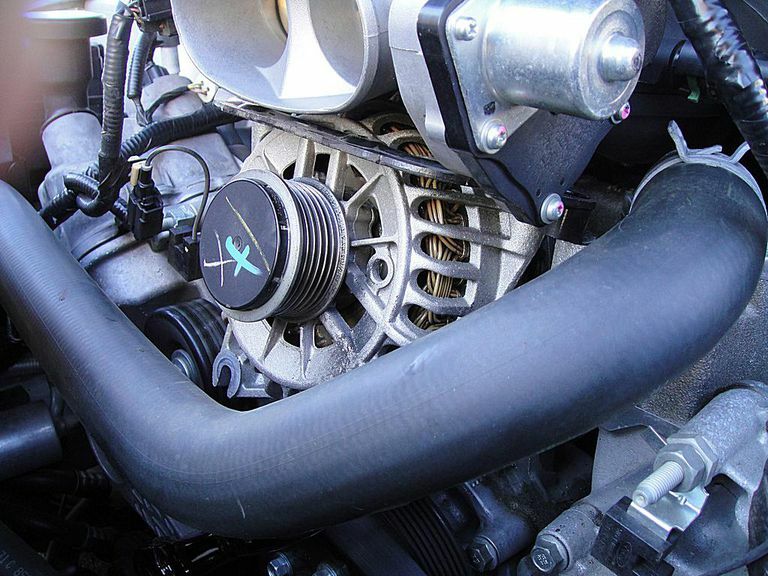 Although there are a few ways to deal with car power shortcomings, including additional batteries, stiffening capacitors, and other solutions, a high output alternator is the only way to address the root of the problem. These high-powered units are essentially just alternators that are capable of putting out a higher level of amperage—either at idle, high RPMs, or both—than factory stock, and they are available from aftermarket manufacturers, rebuilders, and OEMs alike. What Qualifies as a High Output Alternator? Since factory alternators aren’t uniform in terms of power output, the term “high output alternator” is a somewhat nebulous term that is always going to be relative to whatever the factory output of a particular system was rated at. In order to qualify as a high output unit, an alternator basically just has to provide more amperage than the factory unit that it replaces. Of course, that means there is a huge difference between a high output unit that provides 100A at idle speeds and a water-cooled monster that can provide upwards of 350A. There’s also a difference between simple “re-winds” and units that are either remanufactured or built from the ground up to provide a high level of amperage. The first alternators blew older dynamo generators out of the water in terms of raw amperage output, but the electrical systems that they had to supply in the 1960s were nothing compared to what we have today. Many early factory alternators were only capable of putting out a maximum of 30A, which is a number that a lot of modern stock units beat at idle speeds. Today, a typical OEM alternator in an average passenger car or light truck is capable of putting out somewhere in the neighborhood of 50-80A, although there is a lot of variation from one application to another. Of course, it’s worth noting that the “rated” amperage refers to its output at 6,000 RPM, which is why a “108A alternator” may only put out 40 or 50A at idle speeds. Who Needs a High Output Alternator? Since stock units are designed to meet the needs of the electrical systems on the vehicles that they ship with, and most people don’t make significant modifications to their vehicles, most people can get by just fine without adding a high output alternator. So how can you tell if you need to replace a factory alternator with a higher-powered aftermarket unit? One sure sign that an alternator is underpowered for its application is if it burns out too fast. If you find yourself going through alternators on a regular basis, your unit is probably running right up against the ragged edge at all times, which can cause a lot of undue wear. Even if your vehicle is more or less stock, you may want to step up to a high output replacement alternator if you find yourself in the shop for electrical system problems on a regular basis. Since some vehicles ship with multiple alternator configurations, you may even be able to find a direct-fit, original equipment replacement unit. That’s plenty of power for any factory sound system, but if you start piling on amplifiers, subwoofers, subwoofer amplifiers, and other power-hungry components (on top of everything from your headlights to your cooling fan), it’s easy to see how you might end up needing a high output alternator. Of course, it’s also important to remember the difference between idle output and rated output. If the rated output of an alternator is 80A, that means it is only capable of delivering that much amperage when the engine is revved up. Both ISO and SAE standards use 6,000 RPMs to determine the “rated” amperage of an alternator, which roughly corresponds to 2-3,000 engine RPMs.